Gleam ("Gleam", "we" or "us") provides software that helps online businesses (our "Customers") run engaging marketing campaigns that are promoted to customers ("Campaign Users"). In order to ensure confidentiality and lawful processing of its, Visitors, Customers and Campaign Users personal data, Gleam in its capacity of a data controller and of a processor, conducts its activities in strict compliance with the requirements set in the Australia Privacy Act 1988 and Regulation (EU) 2016/679 of the European Parliament and of the Council on the protection of natural persons with regard to the processing of personal data and on the free movement of this data (GDPR). Registration and Contact Information: As appropriate and depending on the Services you would like to use, Customers and Visitors may be asked to provide us with full name, username, email, address, credit card, phone number or billing information. Payment Information: When you purchase the Services, we will also collect transaction information, which may include your credit card information, billing and mailing address, and other payment-related information. Third Party Platforms. We may collect information when you interact with our advertisements and other content on third-party sites or platforms, such as social networking sites. This may include information such as Facebook Likes, profile information gathered from social networking sites during signup or the fact that you viewed or interacted with our content. Gleam is a consent based marketing platform, this means that in order for us to process data on behalf of users they must provide it via explicit consent first. This might be as simple as filling out a form or something more complex like connecting Facebook to their Gleam account. Name, Email & Form Fields: By default each Campaign may collect basic login information from users that includes their full name and email address. By entering campaigns you are accepting that campaign owners will have access to the information you provide. Some Campaigns may also require additional Custom Fields which include Date of Birth (for Age Verification) and other identifiable fields that the user can choose to fill out. 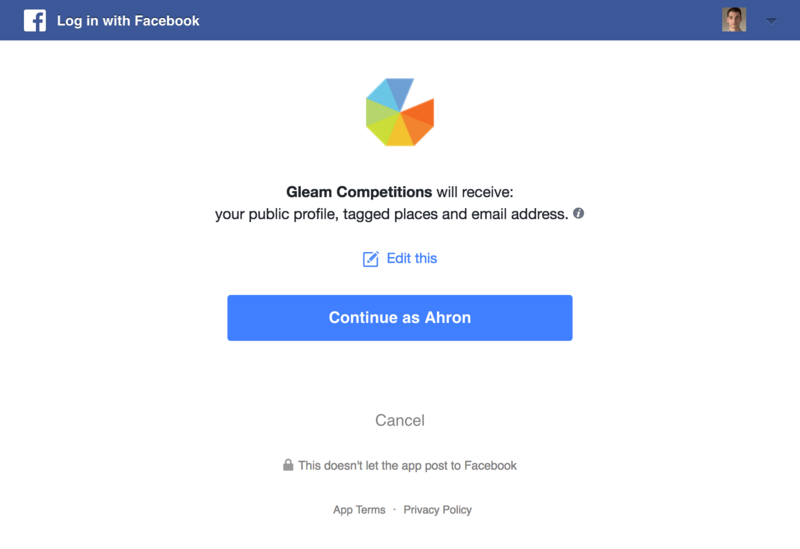 Social Logins: Gleam also allows Campaign Users to connect social accounts to your profile. Companies that have social logins enabled on their Campaigns will be able to see basic information related to accounts that you connect. This includes but is not limited to your name, email address, social profile URL's and associated profile photos. Persistent Logins: Gleam is a distributed platform, which means that if a Campaign User has previously logged into our widget they will continue to stay logged in via third party Cookies across other Campaigns owned by other Companies until they specifically log out. This is designed to make it easy for users to enter more than one campaign without having to re-enter their details again. Gleam does not track or provide any personal information to Companies that run Campaigns until you explicitly provide consent. This means that you do not expose any personal information to Companies until you actively participate in their Campaign (even if you are still logged into Gleam or not). To guarantee the legality of any transfer of personal data of EEA or Swiss citizens to sub-processors located outside the EEA or Switzerland, Gleam applies additional terms via our Data Processing Agreement. Gleam may use third party service providers to help us operate our business or administer activities on our behalf, such as sending out newsletters or collecting Website analytics. We may share your information with these third parties for those limited purposes provided that you have given us your permission. Gleam may also share personal data with third parties to prevent, investigate or take action regarding illegal activities, suspected fraud, situations involving potential threats to the physical safety of any person, violations of our Terms of Service or any other agreement related to the Services, or as otherwise required by law. Gleam uses Stripe to process our credit card payments and no credit card details are stored on our servers. Stripe has been audited by a PCI-certified auditor, and is certified to PCI Service Provider Level 1. This is the most stringent level of certification available. In case of an unauthorized security intrusion that materially affects you or the people on your mailing list Gleam will notify you as soon as possible and will within reasonable time report the action we took in response. The servers where Gleam stores all personal data are located in the US. If you are located in a country member of either the EU or the EEA, please be aware that any information provided to us, including personal information, will be transferred from your country of origin to the US. Except in the case of data transfers under the EU-US Privacy Shield and the Swiss-US Privacy Shield, we may ask for your express consent to provide such data to us or allow us to collect such data. All personal data we process is stored directly, without any subsequent transfers, on US-based servers, which we loan from a third-party datacenter that is certified and adheres to the EU – U.S Privacy Shield Framework. To additionally guarantee to our Customers and their European Campaign users (data subjects) the legality of our processing services and the international transfers of the personal data, Gleam has undertaken GDPR compliant contractual commitments, binding us, as a data processor, to protect the data privacy and to ensure the most adequate level of data security. If you are our Customer and your company is either located in the European Economic Area (EEA) or Switzerland, or your company, by using our services, is processing the data of anyone who is in the EEA or Switzerland, then you can request our GDPR compliant Data Processing Agreement by submitting a support ticket from the Support tab inside your account. Gleam will not retain data longer than is necessary to fulfill the purposes for which it was collected or as required by applicable laws or regulations. For Campaign data, Gleam’s Customers have control of the purpose for collecting data, and the duration for which the Personal Data may be kept. When a User’s account is terminated or expired, all Personal Data collected through the platform will be deleted, as required by applicable law. If a Customer or User account has been suspended for a Terms of Service violation, Gleam will retain the information necessary to continue to enforce this suspension for up to 10 years. Gleam Website Communication: Our Customers, Site Visitors and Users have a choice about how we use their personal data to get in touch with them and may choose to opt-out at any time by unsubscribing or changing their account settings. Campaign Users Notifications: We provide an easy mechanism for opt-ing out of any commmunication from campaigns inside the Post Entry Email. You can simply selec the Unsubscribe or "Turm them off" links in the footer. Campaign Users Social Accounts: We provide a mechanism for every Cmapaign User to remove any linked social accounts from Gleam via the Edit panel inside our campaign widget. Your Rights: We provide all Customers, Visitors and Users of our Site with the opportunity to request access, correction, restriction, deletion, data portability or oppose to any personal information that has previously been provided to us in connection with the use of our Website, as required by law. You can send us an email to privacy@gleam.io. We may request specific information from you to confirm your identity. Because the nature of our Site and Services does not appeal to children under the age of 13, Gleam does not knowingly acquire or receive personal data from children under 13. We do not intentionally process any information, including Personal Data, from children or other individuals who are not legally able to use our Site and Services. If we later learn that any user of our Service is under the age of 13 and that we have obtained his/her Personal Data, we will promptly delete it from our database and will take further steps to restrict that individual from future access to our Services, unless we are legally obligated to retain such data. In some cases, we may choose to buy or sell assets. In these types of transactions, customer information is typically one of the business assets that are transferred. Moreover, if Gleam, or substantially all of its assets were to be acquired, or in the unlikely event that Gleam goes out of business or enters bankruptcy, customer information would be one of the assets that is transferred or acquired by a third party. You acknowledge that such transfers may occur, and that any acquire of Gleam or its assets may continue to use your Personal Information as set forth in this policy.